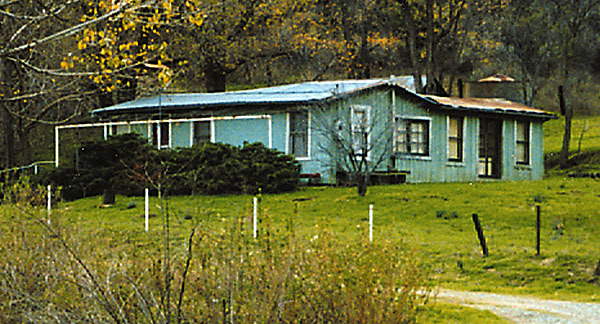 The Larinan ranch house stood on the south side of Pico Canyon Road, halfway between Interstate 5 and Mentryville. Photo 1997 by Leon Worden. Helicopter pilot suffers back pain after landing hard during battle against 20-acre blaze in Pico Canyon. A spark from a tractor clearing brush was cited as the cause of a fire that destroyed one home and charred 20 acres in Pico Canyon. About 125 Los Angeles County firefighters and three helicopters responded to the fire that started at 12:18 p.m. on Pico Canyon Road just north of Stevenson Ranch Parkway. "We were lucky the winds were very light, 5-7 miles per hour at the time of the fire," said Dennis Cross, public information officer for the Los Angeles County Fire Department. While suppressing the fire, one fire department helicopter experienced mechanical trouble and came down hard on an empty patch of land over the hill from the fire. "There was no water in his tanks, so I am assuming he was probably on his way back to the heli-spot to reload," Fire Capt. Steve King said. One witness, Chris Cristian, said he saw the aircraft divert from its primary landing site to avoid a small group of people on the ground. "I thought the thing was going to somersault," said Cristian, project superintendent at the adjacent development site. "I'm surprised the rotors didn't touch (the ground)." Cristian said the pilot did not show any signs of serious injury following the crash. "The pilot was out of the chopper within about 25 seconds," Cristian said. "He was a little dazed and confused and he mumbled something about being glad to be alive." The pilot was transported to Henry Mayo Newhall Memorial Hospital with minor back pain. Destroyed in the fire was the Larinan ranch home, which sat about a mile east of the historic Pico Canyon oil town of Mentryville. Mentryville itself was not threatened by the fire. The structure was home to the Larinan family at least as early as the 1930s. Dorothy Larinan sold the property and moved out in 1993. "I'm so sorry this happened," Larinan said. "It makes me so sad. I feel badly for the (current) owner. Things like that hit hard." Sgt. Russ Brown of the Santa Clarita Valley Sheriff's Station indicated the house was unoccupied. "To my knowledge, the house was vacant," Brown said. Barry Meiger was clearing the brush around the home when the fire broke out. "We were doing weed abatement just for this (reason)," said Meiger, whose escape route back to Pico Canyon Road was nearly blocked by flames. "I had to drive through (the fire) to get out," Meiger said. Ironically, firefighter Dan O'Neil of the Los Angeles County Fire Department said the brush-clearing equipment sparked the blaze. The Larinan home had survived at least three major fires over the decades, the most devastating of which occurred in August 1962. That fire swept through all the local canyons, including Pico, and gutted Melody Ranch in Placerita Canyon. The Larinan home survived— until Saturday. "The Larinan's house was interesting," former Mentryville resident Bill Rundberg, then-neighbor of 1940s classmate Mike Larinan, wrote in 1997. During World War II, the Larinan home had a "gas powered washing machine, a radio that used an automobile storage battery, a Coleman gasoline iron and kerosene lamps," Rundberg wrote. Signal City Editor Leon Worden contributed to this story.